We are a little down here at Appetite for Cake as have recently found out that Keith Floyd has passed away. Keith is acknowledged here as a bit of a food hero – Although I give credit to Nigel Slater’s writing for getting me cooking on a regular basis it is Keith, who as I’ve mentioned before really inspired an interest in food. I’m not going to say anymore, after all I never met the guy and there are no doubt loads of websites out there with tributes, not just the newspapers. I will though, on my way home from work be stopping off and buying the best free range chicken I can find and lots of garlic and cooking the first thing I ever made from a Floyd cookbook the Chicken with Forty Cloves of garlic (apologies to work colleagues for tomorrow) and I will sit down with my chicken supper, a good glass of red, dig out my video of Floyd on France and enjoy ! We’ll miss you Mr F, but you will live on in my family’s culinary heritage ! If you didn’t catch Heston’s Victorian Feast then try and get a repeat somewhere, it is just jawdropping. For many reasons I would place my husband under Y. Partly because he probably the inspiration for the last few recipes, in an abstract way…or least his family history is. It has not gone unnoticed that there has been a run of welsh recipes (Bara Brith, Leek Soup and welsh cakes). I am not welsh, despite spells in Cardiff and on Anglesey, but Husband is, avowedly so (despite being born in Wolverhampton) and in the run up to the 6 nations even more so…I even note that the Student (who 12 days ago started a blog) is also remembering (in the context of rugby) that he is 1/4 welsh. His cooking however is not reminiscent of his welsh blood – I don’t think his grandma cooked. From everything I’ve heard from other relatives I think she considered herself to good to cook. He has a small repertoire of dishes that he cooks very well and without looking at a recipe. He has no pretensions towards posh cookery and doesn’t claim to be anything he isn’t and quite frankly what he does put on the table is very good. I would love to put up here the recipe for Manchester Cheese on Toast but he keeps this secret close and won’t even let me in the kitchen when he makes it. My husband also makes a pretty mean yorkshire pud but won’t share his method. All I know is that it uses 250ml of bitter and takes 40 minutes to cook and that he never gets around to cooking it until I’m advising the family that dinner will be on the table in 20 minutes. Husband I love you. And thank you for doing all the cooking in January I will try and get home earlier in February – promise ! Apart from the slaw for this weeks lunch I haven’t managed much cooking this evening as have been sat on my bottom watching Hugh and his chickens – I missed this last time round. I was trying to salve my conscience as I turned to Husband to say “well, at least we don’t eat much chicken, and what we do tends to come from the Co op” when he pointed out that there is usually a bag of chicken dipper type things lurking not too deep in the freezer. One of my friends, Supermum has a new years resolution that she will not use a supermarket again, except for the local Co op as they are a) a bit more ethical and b) supporting local shops is a “good thing” – I want so much to be a better person but until my herb garden starts growing I shall have to rely on the big pushers to get my drugs of choice (coriander and basil mainly, occasionally mint and parsley – fortunately even I can’t kill off a thyme plant). We tried a cheap distraction technique that all 3 of us would enjoy. We went to the local library. Husband and I floated around the shelves and Spider made a den under the table in the children’s section. I don’t know why, but having been an avid reader from the age of 4.5 until 33 (drivers in Crowthorne frequently used to stare on their way to work at the scruffy teenager walking along with her nose in a book !) I appear to have stopped reading fiction since my son was born…anyway Spider’s ticket was at his Grandma’s so he stole most of my allocation. I came out with Minus 9-1:Jools Oliver – now don’t get the idea that I take my interest in cookery so seriously that I’m even reading books by the wives of chef’s, its just this book came out the year Spider was born when I was going through a lot of what the book is about, and I’d put it on the mental tick list, and since it was in a prominent place I took it out…it’s pretty light and fluffy so I’d managed to demolish it by bedtime anyway. Currently ploughing through Wife in the North:Judith O’Reilly recommended by Husband as he’d heard it on Radio 4…I think he secretly harbours thoughts that someone will offer me a book deal because I’m doing a blog – think not, she was a trained journalist before she started her blog, I’m a lawyer. Nobody is interested in what lawyers think as they are too scared it might cost them ! The other book I’m reading at the moment is Rick Stein’s Food Heroes…now Rick is a slightly strange addition to my Food Heroes list. You see I do not own any of his books and I doubt whether I will ever cook any of his recipes as they are far too cheffy for me…and I’m the only person in the house that eats fish, but he has had an influence in my life and I like what he’s doing now. In a previous life, I used to go to Padstow every new year. There was a lovely tradition that on new years day the boys would cook and the girls would go to the pub. One year we were sent out to get some last minute ingredients and came back, via a couple of pubs and in the last one we went in there was a right old sing song going on and I swear that right in the thick of it was Mr Stein – the boys scoffed at this saying “don’t be silly, he goes to australia every christmas”. Anyway as a result of our frequent Padstow visits and the fact I liked fish, my boyfriend at the time, realising that a man who can cook is by my standards impressive virtually cooked his way through 2 of Rick’s books. So yes Rick Stein is one of my food heroes, but not for his cooking or his recipe books or for the fact he grows his own whatever, but that he’s out there, quietly singing the praises of the producers – and it is quiet and so very very english, but he keeps on plugging away at it…yay, go Rick ! I get a lot of hits on these pages from people looking for Hugh, and presumably his recipes. Guess they are disappointed to find that there’s only a brief mention of the food award he won last year from Radio 4’s Food Programme – oh and a link to his brownie recipe. Hugh is actually one of my food heroes but I don’t own any of his books. I have been an admirer since back in his “Cook on the wild side” days as I love the idea of food for free. 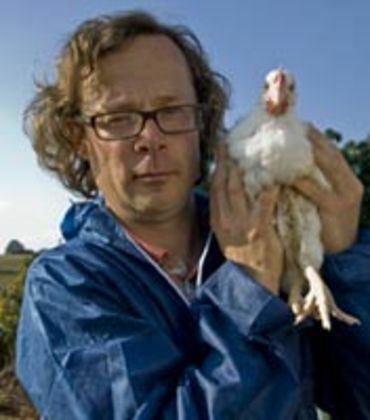 When the River Cottage programmes started I became a full time groupie, I couldn’t get enough of his programmes – but oddly enough it was actually the ideas that he was promoting rather than what he was cooking which was getting me. In fact aside from the Beetroot Brownies I can’t think of a single recipe of his that I have actually been tempted to cook. I am however deeply hooked on the idea of growing my own food and sourcing things more locally…I would love to keep a pig, but I think the neighbour might complain (although historically most of the back gardens down this road would have had a pig from time to time). The highlight for me of this year was the guys in Sheffield who collect unwanted fruit from trees planted by companies, the council or just in forgotten orchards. As a presenter and a journalist I find him fascinating, his words both written and spoken sizzle with passion and enthusiasm but I really don’t know what happens when he puts pen to paper to produce a cook book. Hugh seems to loose all his zing and zip when bound between the hard covers of a cookbook – they really are dull dull dull. But then I am probably in a minority as I do actually read cookbooks from cover to cover rather than use them to cook from…I am reserving judgement though as I’ve only read 3 so far, maybe one of the others will change my mind, not that it matters as if I need my fix there is always the web site. We are not a particularly religious family but Spider does have some adults who are encouraged to give him a different view on life to his parents. In addition to the previously mentioned Not Quite Godfather (NQG) he has his Fairy Gothmother (FGM) and KT Cupcake. FGM is an amazing person, she is my real life Food Hero, but then she seems to have grown up cooking (her mum taught domestic science). She’s always saying things like “we didn’t have anything special for dinner, just this whole salmon I picked up sometime ago and froze just in case”. Apart from the fact that she always seems to get “just the right thing” as a present for her “gothson” and made our wedding cake (if our PC hadn’t blown up I would post the photo here I’m that proud) she also found a most remarkable book and then found a second copy as a present to me. It was a guide, an A to Z of what you can freeze and tips on freezing – and now when I want to use it (thinking of freezing leftover rice pudding) can I find it ? I am a big fan of the freezer and I long to be a proper freezer girl, the sort of person who has planned and frozen meals in advance (other friends I know are ready for unexpected guests as they can whip out a 3 course meal and have it defrosted and on the table before guests have even removed coats). I am working on it. At the moment our freezer is used for leftovers and frozen veg…but I am trying to perfect my version of the instant frozen party in time for Spider’s 4th birthday as there is no way I can whip up birthday party on a Friday evening after a whole week at work – watch this space ! Food Hero: Oh Allegra, you temptress ! Allegra has only recently joined my list of food heroes. I have mentioned before how I discovered her by an internet trawl for something to use cashew nuts in. I then started to read her articles in the Guardian and found that she has a disturbing ability to make me want to go into the kitchen and cook – fortunately though there have been very few cakes/baked goods and a lot of things that the rest of the family won’t eat ! The downside of Allegra is long lists of ingredients some of which do tend to be rather more exotic than my family will eat. Fortunately this has tended to be the “earlier” Allegra (see The Good Cook). The more recent Allegra has concentrated more on eating seasonally (see Allegra’s Colour Cookbook and Colouring the Seasons which I think may be the US version of the Colour Cookbook). Her latest book Leon from the restaurant of the same name (of which she is a co founder) again concentrates on good quality, organic ingredients to make good food for take away. I am getting this book for Christmas (only another 48 hours to wait) and have had to pass it over to my Mum for safe keeping to stop me using it…not before I had copied out the ingredients for George’s Breast Milk Bread (not what you might think thank god !) which I have slowly (with the Flapjack Queen) been collecting together. Anyway, she has done it to me again. In the other weeks Observer she was enthusing about how you can do Christmas dinner on the cheap (well £60)…and well you see, I have been muttering about how I want to try goose for several years now but have been unable to get one for less than £40 and well she mentioned that Lidl do one for £16, and then I was in Aldi on Saturday and discovered that they also do a frozen one for £15…so I now have a goose in my freezer and nothing else planned for boxing day.